The Electro 6 combines Nord's award-winning emulations of vintage electro mechanical and acoustic instruments in an ultra-portable package. With three independent sound sections, a new streamlined user interface and the addition of Seamless Transitions, this is Nord's most powerful and flexible Electro to date, a refined modern classic. The panel has three independent sound sections; Organ, Piano and Sample Synth that can be used simultaneously as a layer or a split. It features six Split Points and the new Split Point Crossfade functionality introduced with the Stage 3 for smooth transitions between two split zones. Choose from 3 different crossfade widths (Small, Large or Off) as indicated by different LED colors. The new streamlined Program section features a handy Organize mode including Copy/Paste and Move functionality for quickly arranging your Programs to your desired order. A new Page View lets you easily sort and organize pages as a song list. The Nord Electro 6 features award-winning Nord C2D Organ simulations of B3 Tonewheel, B3 Bass and Vintage Transistor Organs plus two Pipe Organ models. The extremely authentic B3 Tonewheel simulation features four different tone wheel settings, ranging from factory new clean to leaky old vintage. An improved dedicated Bass mode simulating the Pedal Bass Tonewheels are available for either splitting with a Piano or Synth or with a B3 Upper Manual in Dual Organ Mode. Nord's impeccable simulations of the classic 1960’s Transistor Organs, Vox Continental and Farfisa Compact with all the classic settings, are also included in the Organ section. The Organ section now contains two different Pipe Organ models. The new Pipe 1 is a pure Organ with few harmonics. The Pipe 2, introduced with the Electro 5, is a recreation of metal pipes that commonly make up the backbone of a pipe or church organ, and now includes a special new detune mode when enabling Vibrato/Chorus. The Nord Electro 6 has the latest generation of our vintage 122 Rotary Speaker simulation adding an essential character to a live organ performance and features Slow, Fast and Stop mode as well as a Drive control. The Electro 6D 61 and 73 support the Nord Half-moon Switch (optional accessory). The dedicated new Dual Organ mode provides quick access to dual manual setups and offers great overview and control of the drawbar settings for both the Lower and Upper manual. The Piano section has a wide selection of acoustic, electric and digital pianos from the exclusive Nord Piano Library, extended voice polyphony and creative new Piano Filters. 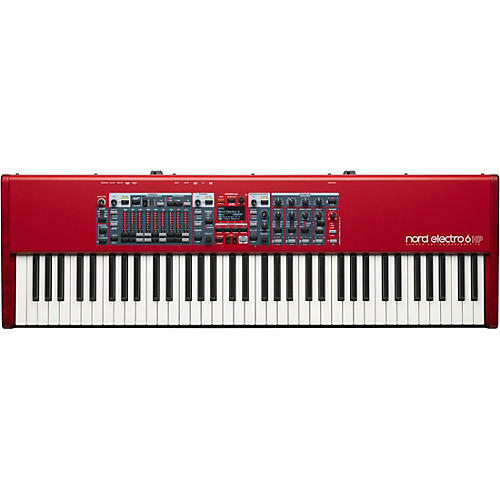 The factory bank contains an extensive selection of Nord's latest Grands, Uprights, Electric Pianos and Digital Pianos from the exclusive Nord Piano Library - all handpicked for their unique characters. The Piano section also features the new “Layer” category with rich dynamic layered patches. Nord’s state-of-the-art sampling techniques capture the extraordinary nuances and real character of the source instruments and unique ‘Advanced String Resonance’ delivers breathtaking realism and an unsurpassed level of expressiveness. The Factory Bank features a great selection from the Nord Piano Library but you can easily add or replace any of these sounds using the Nord Sound Manager. Nord's exclusive Piano Library is constantly updated with new exclusive world class sounds, and always free of charge. Providing an additional level of sonic control, the Piano Section now features dedicated piano filters for accentuating softness, mid or brilliance. A Soft Release-mode adds a slightly longer release, more suitable for legato playing, emulating a looser damper tension in an acoustic or an electromechanical instrument. There are four dynamic curves are available to suit your playing style, from soft to hard. The enhanced Sample Synth Section features expanded memory for the Nord Sample Library 3.0 and extended polyphony. The Sample Synth Section contains a broad selection of high quality sounds from the Nord Sample Library 3.0 including the exclusively licensed sounds of the legendary Mellotron and Chamberlin. The Sample Synth is equipped with essential controls for attack, decay/release and dynamics (filter/velocity). A unique Nord feature allows you to create your own samples using the free Nord Sample Editor software for Windows and Mac. The powerful Effect section features a wide range of instantly tweakable high quality effects modeled after classic stomp boxes. All effects are stereo and can be assigned freely to the Organ, Piano or Synth sections. Here you can choose from Tremolo, two Wahs, an Auto-Wah, and an AutoPan. Use the AutoWah with a Clavinet for raw funk licks, create a psychedelic vibe with an Electric Piano on AutoPan, or give a Wurlitzer some body using the Tremolo. There is also a Ring Modulator on board, an effect used by many experimental and electronic musicians. The two Phasers, two Choruses, the Flanger and a Vibe effect are modeled from the classic analog stomp boxes that define the sound of popular music. Features authentic JC, Twin and Small speaker simulations with adjustable Drive, plus a separate Tube Drive simulation and a Compressor. A 3-band Equalizer with sweepable mid. The Delay effect features a Tap Tempo, Feedback and Mix (Dry/Wet), as well as controls for Ping-Pong mode and Tap Tempo. The Nord Electro 6 has three different Reverb types (Hall, Stage and Room) for adding some ambience to your sounds. All Reverb types also has a Bright mode. One year parts and labor warranty on all Nord and Ddrum products with the exception of 30 day warranty on drum triggers.